Gambian Master Percussionist, Singer, Composer, Teacher and Cultural Ambassador. Born in The Gambia West Africa, King has been performing professionally since the age of 12. King developed his skills in the coastal fishing village where he grew up surrounded by the griots (hereditary musicians) and international musicians who were his mentors for Senegambian drumming and cultural priorities. In his late teens he formed his band Kunta Kinteh and consequently toured The Gambia, Senegal, UK and Europe. King has since built an international reputation as a master of many African drumming styles on instruments such as the Djembe, Boucarabou, Doundoun and Sabar, performing and teaching percussion to students from around the world. Since arriving in Australia, King has developed a reputation as being a sensitive versatile and dynamic performer. 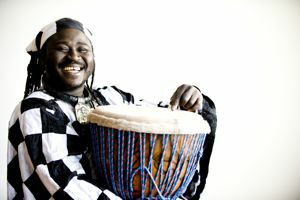 He has worked extensively with local West African, Australian and international artists to introduce the complex and powerful drumming rhythms, melodic kora music and vivid dance style of his culture to Australia. His involvement in many collaborative projects has enabled him to work with both local and international musicians across all genres of music from classical to electronic and the world of styles in between. King has several Melbourne based ensembles which range from the high energy and visually dynamic traditional percussion and dance rhythms of Safara to the sleek and sophisticated �afrobeat-jazz-reggae-fusion� of his band Afro Mandinko. For this project King has been collaborating with some of Melbourne�s premier musicians, playing and arranging the traditional songs of the Gambia and Senegal with a contemporary big band feel. 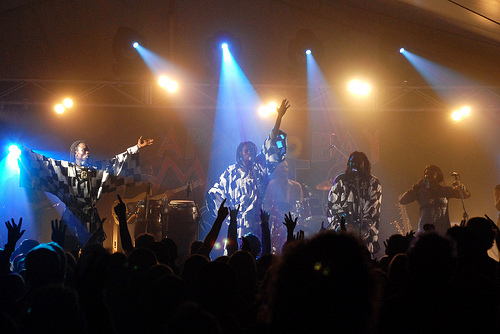 His most recent collaboration with fellow West African Lamine Sonko One Africa brings you everything from melodic guitar and vocals to explosive and engaging percussion and dance in their interactive show. Hey broder, seen your web very impressed with what you do. We’ll keep intouch Insh’Allah.